Fish Oil is a popular supplement because of the Omega-3 oils, which study after study has shown is good for health. I got my first introduction to fish oils after reading the book The Great Cholesterol Myth. In it, the book covers why statins are often times a poor solution to lowering cholesterol and more natural remedies should be tried first. One of the items they cover is fish oils derived from wild Alaskan salmon. That being said, I decided to do some more research on the topic of fish oils when I noticed quite a few other friends had bottles of fish oils in their home. Prefer anchovy over salmon, which are lower on the food chain meaning less chance of mercury. Will cause fish-breath, which isn't unhealthy, but can be unpleasant. More than 3 grams a day might prevent blood from clotting. Recommend around 1000 mg of omega-3 per day (EPA and DHA should equal at least 1000). Low doses are healthy and protect against stroke, but high doses can increase the odds of a stroke. Ideal to eat Omega-3 supplements with a meal. Make sure to follow the instructions on your bottle. Some require taking 2 soft gels. If you take blood-thinning medications, consult a healthcare provider. Reports show prescription variants of Omega-3 supplements are beneficial while over the counter variants of Omega-3 supplements have much less effect. If you're "eating 4 ounce servings of fish 2-3 times a week" or "eating walnuts/flaxseed everyday", you're already consuming sufficient amount of Omega-3 and likely don't need fish oil supplements. 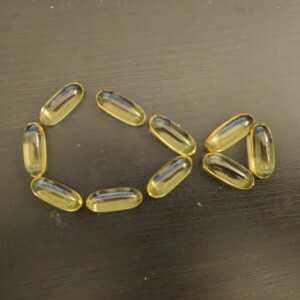 For price conscious consumers, fish oil supplements are cheaper than buying actual fish. However, as a health nut, eating a real fish will probably carry other benefits. Caused by exposure to heat, light or oxygen. Gel capsules provide more protection against oxidation than liquid formulations. Other antioxidants like Vitamin E or rosemary extra may slow oxidation. Upon the findings, I find that even though the benefits aren't guaranteed, if fish oils (even at $50 per bottle) can improve my cholesterol numbers, and therefore my overall health, that is very much worth it in the long run. After extensive searching on Amazon, I settled on BrainPower+ Omega-3 Fish Oil for $24.97 for a 180 pill (90 day) supply. Rated at 4.6 stars from over 1355 reviews. According to a BrainPower+ in 2015, the last 6 tests (batch per batch tests) all rated at <1 PPB with a company standard of 3 PPB. The Global Organization for EPA and DHA Omega-3s (GOED), an industry trade group, is 100 PPB. The average of all major fish oil companies is around 4 PPB. I'm about halfway through the bottle. I do experience fish burps, but I because I take the fish oils at home after dinner, it doesn't really bother me. When I finish up this bottle, I do plan on purchasing more fish oil. Afterthoughts of "The Great Cholesterol Myth"